Please note that I made this review for my teams forum where my username is Kid. I just didn't want to redo all the pictures. Also this is my first review, so any suggestions are fine. 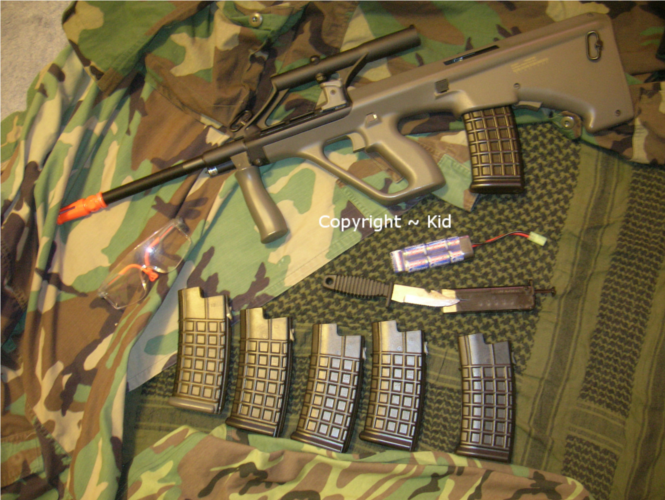 Gun being reviewed is the Echo1 Phantom II, also known as the Steyr Aug A1, and Military version. Real Steel, Source- Wikipedia: The AUG is an Austrian 5.56mm assault rifle, designed in the early 1970s by Steyr Mannlicher GmbH & Co KG (formerly Steyr-Daimler-Puch). The AUG (Armee Universal Gewehr—"universal army rifle") was adopted by the Austrian Army as the StG 77 (Sturmgewehr 77) in 1977, where it replaced the 7.62 mm StG 58 automatic rifle (a license-built FN FAL). In production since 1978, it is the standard small arm of the Austrian Bundesheer and various national police units. Price: I paid $175 for it at www.airsoftgi.com. Was on sale. FPS: I chronod it the first game and it shot at the high 350s, low 360s. BPS: It shot at 14 BBs per second. With a Intellect 8.4v. Weight: Without battery and mag filled with BBs- Around 8 pounds. Are you tired of seeing the Flinstones background when you play airsoft? M4, Ak-47, M16, M4, Ak-47, etc. Now you can be different! Now, some of you may think that this gun is ugly; however looks are in the eye of the beholder. The gun has a very nice finish to it, in the pictures however it looks really shiny. However when looked at in real life it looks awesome. When I got home on 9/11/08 (Never Forget). I got home and immediately started to wait on the UPS guy, but then my dad told me he needed me to help him with something. Then he started playing games with me, saying it was here, and saying it wasn’t. After five minutes of this he finally told me it was in the closet down stairs. So I start running and…. Slipped and fell down the stairs, but got up and got it. When I opened the box up, I could have sworn it was the real thing. Except for the orange flash hider. It doesn't really look realistic in the pictures do to the flash. Pics if requested. This gun is pretty comfortable, but to some it isn’t. So I would recommend that if you’re thinking about buying this weapon to try it, if you’re worried about that. One downfall on the rifle is its weight. Now eight pounds doesn’t sound like much but after awhile it got kind of heavier. If you’re used to support rifles, unlike me you should be fine. Could always just buy a sling. 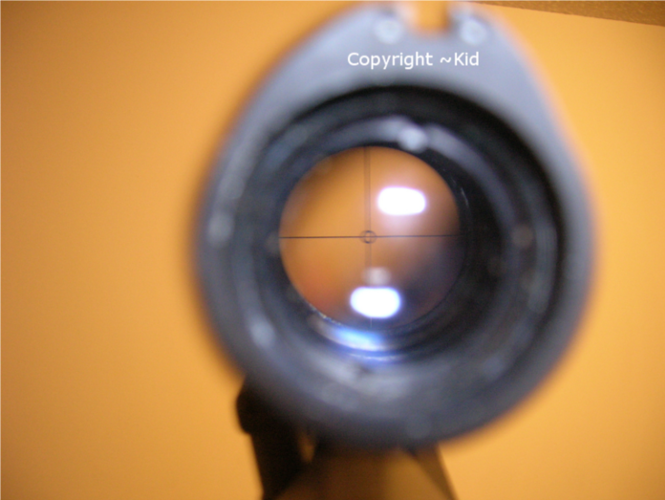 The sight is either a 1.5x or 3x. I remember reading somewhere that it is a 3x, but other people say its a 1.5x. It also seems to have an Iron sight on the top, don't know why. It is very useful if you want to make this into a DMR which I want to do, but if you’re going to make it into a CQB version then I would recommend the Phantom I / Civilian. The scope can be adjusted though. There is one downside, and that is the charging handle is very squeaky. Look at video and you should be able to hear what I mean. It shows the charging handle, scope, and vertical grip. Its okay, however it does feel flimsy, but so is the Toyko Marui version. Please see video for demo. Does not feel like it will brake off though. How a gun shoots is very important. Like stated above in the statistics, the gun shoots at 350-360 FPS and 14 BPS. Thanks to a teammate’s Chrono. The two- stage trigger is very unique to me. However after getting used to it I really started to like it. I could go from accurate single shot fire to full auto cover in less then a second. This can even be improved by some aftermarkets, like MOSFETS. It’s fairly hard to say what’s accurate or not. At my first game the sights where off to the left so I couldn’t figure out if it was indeed dead on or not, but seemed very good. I did take it to a safe spot to shoot at a pie tin(which is the size of the human head), and I was easily able to get 3 maybe 4’ (inch) grouping at maybe 50-60 feet. What is kinda strange is that it was very windy; my .20 gram bb was flying possible 1-2 feet away from where it usually shot without much wind. Should be a lot better with a tightbore barrel, better hop up, better internals like upgrade kits, and possibly a SCS nub. Depending on what upgrades you like. Not really any complaints here. 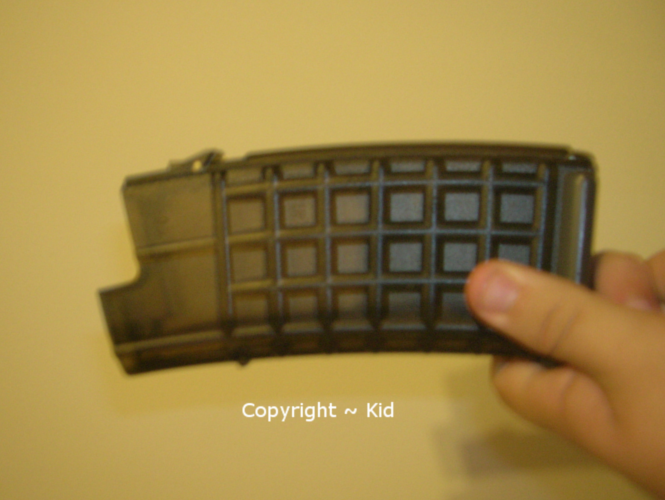 The original one that came with the gun was kind of wobbly in the magwell. The Kings Arms Midcaps fit great. However one of the KA midcaps’ o-ring broke. I believe these King Arms midcaps are not that good. I already had 2 brake on me. They are also plastic. Buy the MAG brand ones. The battery it takes is the small type, however you can buy a custom made 9.6v. The compartment is very small but still useable. Any questions or picture requests just ask/ pm. 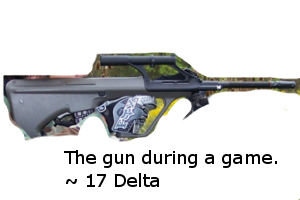 Can be changed to a DMR, cqb, etc. Many roles. MAG brand midcaps have finally made some AUG mags. Can’t think of any else at the moment. It is a very good rifle for the price and can become deadly with all the aftermarket parts available. I would definitely suggest that you try to hold/ shoot something similar to help you make up your mind. Also Please, please, please read other reviews about this gun. Just make sure you do your research about it. I would possibly suggest the Phantom I, because you can then use the rail system to add any type of optics to it. Hope you guys injoyed my first airsoft gun review. If you see any spelling mistakes please just PM me. Did you not see? Post this in the "Applications" section, and if it's approved we'll move it. I would have approved this anyways, though, so I'll keep it here. That's wierd, I could have sworn I posted this in the Applications section. Sorry about that. » Anyone using a Echo 300c FF ?